The International Parliamentarians for West Papua (IPWP) is a cross-party group of politicians from around the world, supporting self-determination for the people of West Papua. IPWP launched in the Houses of Parliament, London on 15th October 2008. Speakers at the launch included Melinda Janki (International Human Rights Lawyer), Hon. 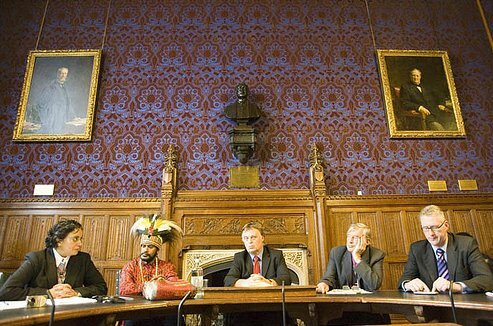 Andrew Smith MP (UK), Lord Harries (UK), Hon Lembit Öpik MP (UK), Lord Avebury (UK), Benny Wenda (West Papua independence leader), Hon. Powes Parkop MP (Papua New Guinea), Hon. Carcasses Moana Kalosil MP (Vanuatu) and Carmel Budiarjo (TAPOL). Messages of support at the launch came from individuals including Bob Kennedy (US Democrat Party). Since 2008, there have been further launches of IPWP held in Port Moresby, Papua New Guinea hosted by Powes Parkop in September 2009, and in the European Parliament in Brussels hosted by Caroline Lucas MEP in January 2010. IPWP was set up by exiled West Papuan independence leader Benny Wenda, and is co-chaired by the British politicans Andrew Smith and Lord Harries. Andrew Smith is also the Chairman of the British All Party Parliamentary Group for West Papua. 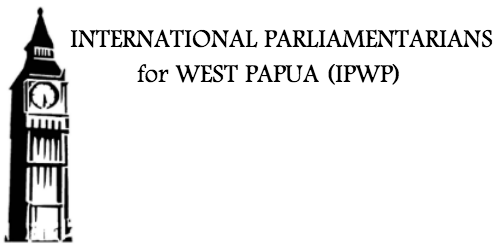 The goal of IPWP is to develop international parliamentary support and awareness for the West Papuan civil resistance movement, the illegality of the 1969 Act of Free Choice, and to highlight the inalienable right of the people of West Papua to determine their own future through a free and fair referendum. The IPWP takes as its model a similar group that helped lead the independence movement of East Timor. If you are a Parliamentarian and would like to add your voice, please follow this link. © 2016 International Parliamentarians for West Papua (IPWP).